The bladder is a hollow organ, which stores urine produced by the kidneys. Urine passes from each kidney into the bladder through a tube called a ureter. An outer layer of muscle surrounds the inner lining of the bladder. When the bladder is full, these muscles contract to expel urine through the bladder outlet, the urethra. The bladder is lined with cells called transitional cells. The majority of bladder tumors arise from these cells and are called transitional cell carcinoma (TCC). TCC is a type of cancer and represents about 90% of bladder tumors. Other types of bladder cancer include squamous cell carcinoma and adenocarcinoma. There are also benign (non-cancerous) tumors of the bladder, which generally do not come back after they are removed. Bladder tumours are often diagnosed during the investigation of blood in the urine (hematuria). Occasionally, these tumours can cause urinary problems with pain or increased frequency and urgency to void. 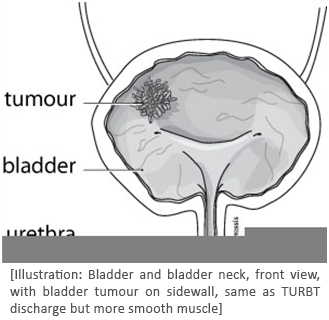 The diagnosis of bladder tumours is made after visual inspection of the bladder (cystoscopy). At times, they are identified on ultrasound examination of the bladder or inspection of the urine for cancer cells (cytology) or other urinary markers. Once a tumour has been discovered it can be biopsied at the time of cystoscopy to make a diagnosis. More often, wet will recommend a surgical procedure to have the tumor scraped away using an instrument passed through the urethra (trans-urethral bladder tumour resection or TURBT). A bladder tumor resection is often performed at the hospital. The risk of bleeding is increased in patients taking blood thinners, aspirin, some arthritis medications, or many herbal supplements. These drugs normally should be stopped prior to surgery and should be discussed with a physician. The surgery is done usually either by spinal anaesthetic (“freezing” from the waist down with a needle in the back) or by general anaesthetic (putting one to sleep). This operation is performed with an instrument called a resectoscope, passed into the bladder through the urethra. No skin incision is required. The bladder tumour is scraped away and removed in small pieces. Bleeding is controlled with cautery by electric current. The entire procedure usually takes no more than 90 minutes. At the end of the operation, a catheter (drainage tube) may be placed into the bladder through the urethra. A water solution may be used to flush the bladder to wash out any blood in which case you may remain in hospital for a day or two. The doctor may prescribe a chemotherapy drug to be placed in the bladder soon afterwards in order to decrease the chance of the tumour coming back. The catheter may be left in place for up to two days until the urine is fairly clear. Discharge usually occurs about one to three days after the operation. In some cases, the patient may be discharged on the day of surgery. Most patients should be able to resume usual activities and return to work in a few weeks. Most bladder tumors are confined to the bladder lining or superficial. Even these superficial tumors however have a tendancy to recur. It is imporant to monitor the bladder closely with regular bladder inspections (surveillance cystoscopy). In some cases we may recommend additional treatments in order to decrease the chance of tumor recurrence. These treatments may involve placing a drug directly into the bladder through a small catheter. There are several medications available including BCG and mitomycin. Occasionally, more aggressive tumors may invade into the muscle of the bladder wall or spread to other parts of the body. This requires more intensive investigation and treatment, which may include surgery (removal of the entire bladder), chemotherapy or radiotherapy.